Chris Newport of THE EVERYDAY ATHLETE MATTERS will be leading a free, in-store seminar about running nutrition on August 16th at Fleet Feet Sports Morrisville. Here, she discusses the importance of hydration and offers one of her favorite homemade sports drink recipes. Hydration is critical in this heat. Excessive heat and humidity are some of the most dangerous conditions for athletes. To hydrate the most effectively, a sports drink should have 3 major components in one bottle: fluid, electrolytes and carbohydrates. However, many of them have some sort of artificial colors, sweeteners or other junk in them. Others don't have the right amount of carbs or electrolytes in them. This recipe for a homemade sports drink not only saves you money but is very flexible to make it work for your own taste buds. I happen to love lemon juice. If you don’t like lemon juice, use your favorite juice (or combinations): orange, lime, cranberry, pomegranate, pineapple, you get the idea. Just make sure it’s not low sugar or sugar free. You want the sugar. Remember, this drink serves a purpose: to fuel you for your long or high intensity workout…not to sip on throughout the day. 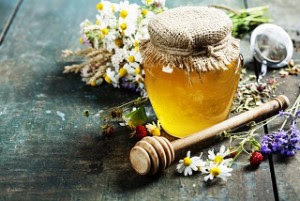 If you can’t tolerate honey (many of my fructose intolerant clients don’t do well with it, especially in large quantities), you can use corn syrup (yes, the stuff you get at the grocery store–just keep in mind it tends to have vanilla flavoring–which can be super yummy or way gross), brown rice syrup, or maple syrup. Or you can substitute it with sugar, which you’ll need 4T (1/4 cup) instead of 3T. It will likely be a little sweeter, so be warned. If you do choose honey, your drink will take on that flavor. So be sure it’s a honey you like! Honey is naturally flavored based on whatever plant the bees are getting their nectar from. So you can choose clover honey, wildflower, orange blossom, or whatever you prefer. Check labels too and make sure your honey is from the USA. This might go without saying, but I’m going to say it anyhow: use good quality filtered water and a good quality salt. Measure your salt well. If you’re a “salty sweater,” you can add another 1/8-1/4 tsp to the recipe. If you really want to get fancy, you can steep ginger, tumeric, cinnamon or other spices in the hot water for 5-10 minutes. I like using green tea instead of the water for the flavor, caffeine and antioxidant boost. You can try coconut water too if you need extra potassium, but it’ll throw off your carbs a bit. Get creative. Why not? Now get out there and run, ride, or tri with your new fuel!